This book presents an introductory treatment of Allen-Bradley programmable logic controllers (PLCs) with an emphasis on program design. 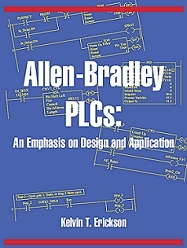 This text stresses an organized approach to developing PLC programs - “Given a set of operational specifications, how does one develop the PLC program?” This book develops the design process: the tasks involved, breaking the program into manageable pieces, standard code for the various parts, and handling the sequential parts of the problem. Throughout, the book contains example problems demonstrating good design practice and culminates in a full-length case study. Many chapters have student problems that can be assigned. Due to its popularity, ladder logic is employed in the text. This language is covered for Allen-Bradley ControlLogix, CompactLogix, MicroLogix, and SLC-500 processors.